Because of today's unhealthy environment and the polluted air we breathe, we receive only about fifty percent of the oxygen needed for our bodies to function as they are designed to. It has become necessary to increase our oxygen absorption in order to give our bodies the tools necessary to function properly and to experience dynamic health! 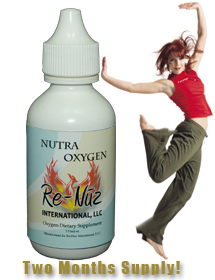 Oxygen supplementation is a great source of natural sustained energy as well as being a very efficient detoxifier. NutraOxygen is a great value for the money. Not only does NutraOxygen have almost twice as many ingredients as other oxygen supplements, but NutraOxygen is also a two (2) month supply! Ingredients such as: Cordyceps Mushroom, Spirulina, Ionic Trace Minerals, Rice Vinegar, Green Tea Leaf, Amino Acids, and Ginseng Root. NutraOxygen uses a new proprietary process for creating oxygen in the body to deliver directly into the cells themselves. This process, once activated by the pH of the body, causes a chemical reaction. This reaction "throws off" oxygen molecules, while at the same time destroys itself by breaking down into amino acids. This is the safest, most highly efficient form of liquid oxygen delivery to the cells possible in a liquid oxygen supplement or liquid oxygen drops. Each order has a 60 day money back guarantee. The NutraOxygen formulation includes powerful plants, ionic trace minerals, enzymes, and other beneficial additions and everyone should be eating raw, organic whole foods to attain or maintain a high quality of life. We also like to share a link to a 5 minute virtual tour video of an incredible hospital in Mexico (Sanoviv). The protocol at Sanoviv is to "flood the body" with oxygen and nutrition. (To bring it back to a healthy state, of course!) Because most people do not save thousands of dollars to travel abroad when their health is compromised, the next best thing to do is look for powerful products to use right at home. Please use the contact us link if you need more information! We're always happy to help! Expect Miracles! Visit us at Re-Nuz to learn more out our exciting product line and to order your NutraOxygen! You can also reach us by phone at 800-594-5936.